A truck passes the Norwegian border towards Sweden, Feb. 8 2019. Norway's hard border with the European Union is equipped with cameras, license-plate recognition systems and barriers directing traffic to Customs officers. FILE - A car crosses the border from the Irish Republic into Northern Ireland, Jan. 30, 2017. 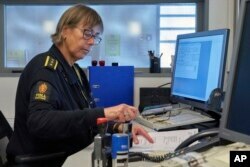 Chief Customs officer Nina Bullock was handling traditional paper clearance forms, Feb. 8 2019, as her computer informed her of an incoming truck using a new digital customs clearance system that allows transporters to drive through customs without stoppiing. A sign at the entrance of the border post informs travelers that they are entering Norway, Feb. 8 2019. Norway's membership in the European Economic Area grants it access to the common market and most goods are exempt from paying duties but everything entering must be declared and cleared through customs. Truck drivers with customs clearance documents walk toward the Norwegian Customs office at the Orje border as officers perform checks on cars entering from Sweden, Feb. 8 2019.